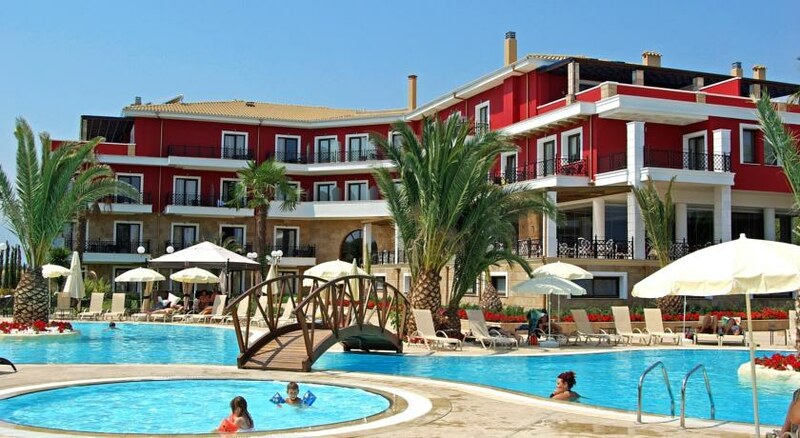 The fabulous Mediterranean Princess Hotel rests 400 m from the coast of the Paralia-Olympic Riviera, just 6 km from the town of Katerini, 25 km from Litohoro, at the foot of Olympus, 36 km from the ski resort of Elatochori and 62 km from Thessaloniki. 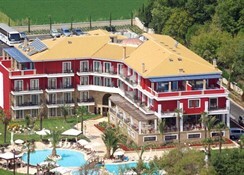 Set in a perfect position to enjoy summer and winter facilities, this superb 4 Star hotel makes a luxurious base for couples and families with delicious dining, fully equipped events and conference facilities, and well-appointed double guestrooms with all the amenities expected in a 4 Star hotel. Guests to the Mediterranean Princess Hotel have opportunities for exciting excursions nearby including the ski resort of Elatochori, located in Pieria Mountains, just 30 minutes from the beach. Getting to the Hotel: Thessaloniki International Airport is 73 km from the Hotel. Local Tips: Access is very easy to Meteora, Athens, Skiathos, the waterfalls of Edessa, the Ag. Oros (Mount Athos), Thessaloniki, and much more! Dining: The Hotel is booked as Half Board accommodation. Mediterranean Princess is proud to present the main Apelles Restaurant for different tastes from Greek and international cuisine with emphasis on the Mediterranean diet. The restaurant offers American Breakfast and Dinner Buffet. It can accommodate 200 people, while the A la Carte restaurant, with the chef of the hotel, can meet the most demanding clients. The central bar Hibiscus hosts theme nights and cocktail parties. 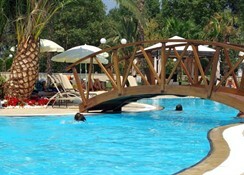 Activities: Extensive gardens with olive, palm and pine trees, beautiful flowers and herbs, swimming pool, sun terrace, sun beds and umbrellas. Additional: 24 hour reception, currency exchange, laundry service, room service, Wireless (Wi-Fi) Internet access and business centre. The Icarus Conference Center has multiple possibilities, perfect for holding conferences, exhibitions, professional meetings, workshops, symposia and social events, with a capacity of 200 people. 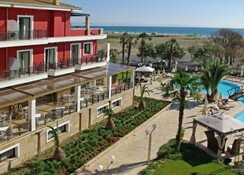 The Mediterranean Princess Hotel features Double Guestrooms that can accommodate up to 3 people. All rooms are equipped with bathroom facilities (hair dryer, magnifying mirror), hot and cold air conditioning, safe, magnetic lock, direct dial telephone, LCD Satellite TV, fast Internet access, mini bar, and a balcony with a lounge.